The average temperature in April for St. Andrews Scotland, the birthplace of golf, is a high of 50° and a low 30°. It is said they have 6 months of winter, and 6 months of rain. So any day that isn’t raining, is a good day for golf, and even a rainy day is a good day for golf as long as there isn’t lightening. Early morning at the course, especially after a rain makes me feel like I’m in Scotland. It’s cool, quite and misty. As long as I’m bundled up, there’s no place else I’d rather be. 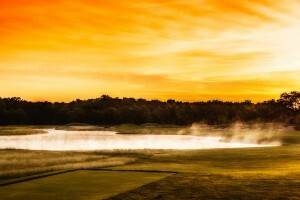 This photo is taken just after sunrise from the white tee on the second hole, which is a par 4.